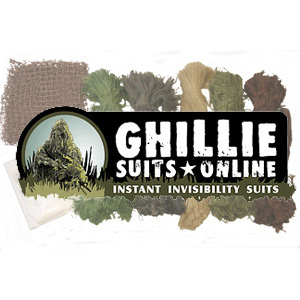 Our Ghillie Suit Kit includes everything you need to make the popular ghillie poncho or the Stalker Suit. The kit includes 7 lbs. of pre-tapered and dyed jute and burlap thread. Also includes complete instructions on how to assemble the 5'x 9' nylon net with the 1" x 1" squares to make a full ghillie poncho. Also offered in a package that contains the most popular colors, the Ghillie suit kit has everything you need to do it yourself. Kits usually take about 7 or 8 hours to complete. Includes a 1 lb. Bag of flame retardant.